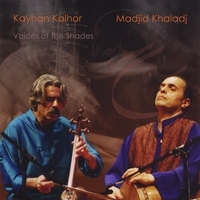 highly anticipated, first duo CD in exceptional master-musicians of Persian music Kayhan Kalhor & Madjid Khaladj..
We are fortunate today, to have a constellation of master performers and composers to turn to for purely exaulting innovations in what only thirty years ago seemed like a closed system of musical composition and performance relegated to history books. Without fail, each new composition and every new performance surpasses the accepted boundaries and offers evidence of endless inventions and discoveries within the realm of Persian classical music. It even offers what has been extremely difficult to produce in music, that is, reflections upon music using music itself as the means of communication. These masters play music like linguists talk about language using language. Numerous music lovers familiar with the work of Keyhan Kalhor and Madjid Khaladj have anticipated an improvisational duo performance for years. We had heard each of them playing with other masters, but never together, lest a brief concert in Basel Switzerland in 2008. Now, these two talented performers unite for a long duo that surpasses all that we had anticipated, or remotely imagined. The important aspect of this performance is the perfect meshing of Kalhor’s string instrument with Khaladj’s innovative style of percussion. Seldom have we heard a string instrument accompanied by percussion of such free form that has been developed by Madjid Khaladj over the last two and half decades. As of this moment, words still fail the writer to explain how they actually manage this feat, going well beyond the stated obvious problem and presenting a new way of turning a string instrument to become crisp without boorish staccato playing, and the tombak so melodic and flowing. The kamancheh, for the first time in memory becomes at times a rhythm instrument while the percussion overlays it with a melodic flow of soft beats and even softer finger rolls that sound as if they are lightly touching a keyboard rather than hitting a stretched skin. The net result is a gift we are elated to receive. At a time that innovation in arts often tends to be new combinations of the old, we have a performance in which musicians speaks about music through music. If one function of art is to question its own existence, listening to this album we can only ask how we didn’t hear this, or see this before within music, the study of the meaning of melody and rhythm. The answer is being brought out of the shadows by these masters.